The workers were walking along the pedestrian platform as a rashly driven SUV, whose driver was allegedly drunk, rammed the vehicle on them. CHENNAI: Four migrant workers from West Bengal walking along the pedestrian platform were severely injured as a rashly driven SUV, whose driver was allegedly drunk, rammed the vehicle on them. 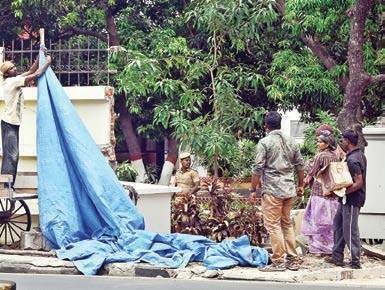 Police said the four victims, who were working in a hotel, were walking back home on the DG Dinakaran Salai around 1 am on Friday. “The driver lost balance when crossing a speed breaker in the road and drove the vehicle on the pedestrian platform. The vehicle came to a halt only after ramming the compound wall of the Chief Justice’s official quarters,” said a police officer who visited the spot. The cab driver has been identified as M Ayyappan, aged 30, working in a private call taxi company. He was said to be travelling along with his uncle Velayutham when the accident took place. The police identified the four victims as Robin, 28, Benjamin, 28, Amit, 25 and Karkaiya, 19, all natives of West Bengal and working at a restaurant in the same stretch. Ayyappan told the police that he did not notice a speed breaker and lost balance of the vehicle which resulted in the accident. “The force with which the car rammed the wall broke a portion of it. The security personnel stationed at the residence immediately nabbed the duo and handed them over to the police,” said the police officer. Chennai city Police Commissioner A K Viswanathan, along with other senior officials, visited the accident spot. Meanwhile, the four injured were rushed to the Royapettah government hospital and later three of them were shifted to the Government General Hospital. “Robin was discharged while two others left the hospital against medical advice,” said a staff at the hospital. During investigations it was revealed that Iyyappan, a native of Vriddhachalam worked as a driver in Fast Track. On Thursday night, he along with his uncle took liquor in a TASMAC outlet at Kodambakkam and were on the way to Adyar when they rammed the men. A case has been registered under IPC section 279 (Rash driving or riding on a public way), 337 (Causing hurt by act endangering life or personal safety of others), 338 (Causing grievous hurt by act endangering life or personal safety of others) and 308 (Attempt to commit culpable homicide) by the Adyar Traffic investigations. The men were produced at the Saidapet magistrate court and remanded in judicial custody.